Today we are going to learn and practice three foundational CrossFit Kettlebell techniques. In CrossFit, many times the default technique for the kettlebell is the American swing. However, in the CrossFit Kettlebell Trainer Course, there are over twenty different skills that must be learned in order to successfully pass the Course! Therefore, in preparation for the CrossFit Kettlebell Course coming to CrossFit Amundson in September, we are going to make Friday’s our “Kettlebell Day!”The three skills we will learn today are the arm-bar stretch, floor press and the turkish get-up. And of course, stay tuned for the “unknown and unknowable” workout! On Thursday, July 5th, 2012, Chris Hankes surprised Greg Amundson with the presentation of an American flag that was carried by Chris in reconnaissance operations during his recent overseas combat deployment. In addition to his service in the United States Military, Chris is also a Deputy Sheriff in Santa Cruz County. Chris has been part of the CrossFit Amundson family for several years and is deeply respected in our gym. 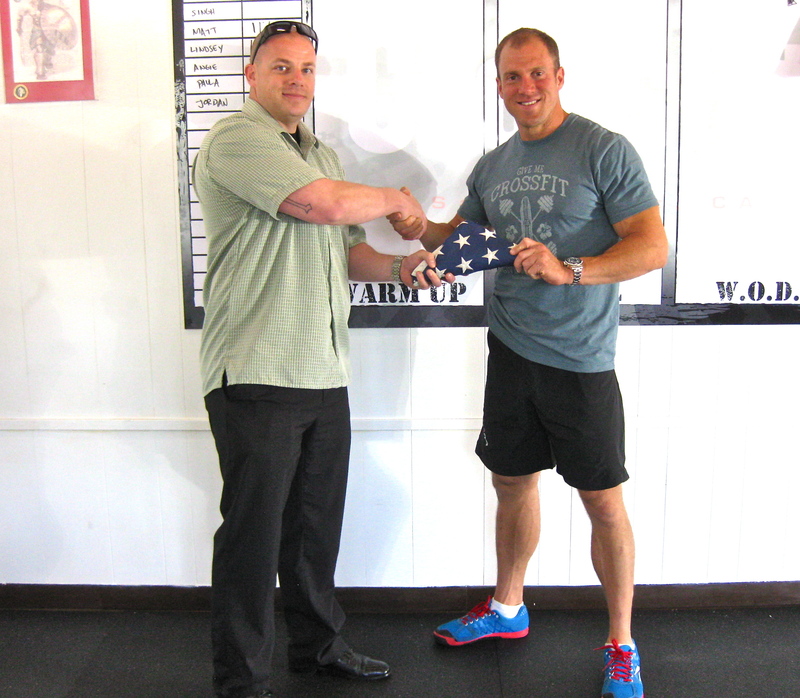 The flag is now on display inside CrossFit Amundson and serves as a reminder of the bravery and sacrafice modern day warriors make for the American people on a daily basis. On behalf of the entire CrossFit Amundson family both in Santa Cruz and around the World, thank you Chris! Reminder! We are doing a gym breakfast at the Silver Spur today at 8:45. First person there get a table for about 10 hungry athletes!